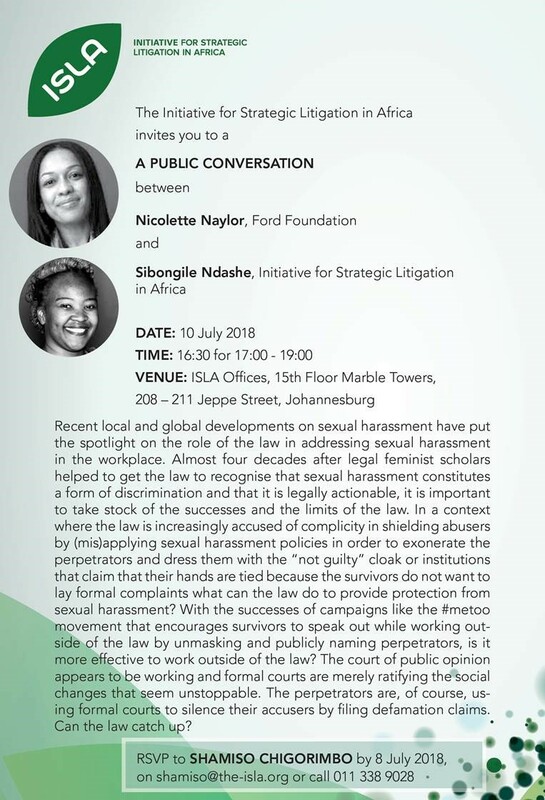 Recent local and global developments on sexual harassment have put the spotlight on the role of the law in addressing sexual harassment in the workplace. Almost four decades after legal feminist scholars helped to get the law to recognise that sexual harassment constitutes a form of discrimination and that it is legally actionable, it is important to take stock of the successes and the limits of the law. In a context where the law is increasingly accused of complicity in shielding abusers by (mis)applying sexual harassment policies in order to exonerate the perpetrators and dress them with the “not guilty” cloak or institutions that claim that their hands are tied because the survivors do not want to lay formal complaints what can the law do to provide protection from sexual harassment? With the successes of campaigns like the #metoo movement that encourages survivors to speak out while working outside of the law by unmasking and publicly naming perpetrators, is it more effective to work outside of the law? The court of public opinion appears to be working and formal courts are merely ratifying the social changes that seem unstoppable. The perpetrators are, of course, using formal courts to silence their accusers by filing defamation claims. Can the law catch up?